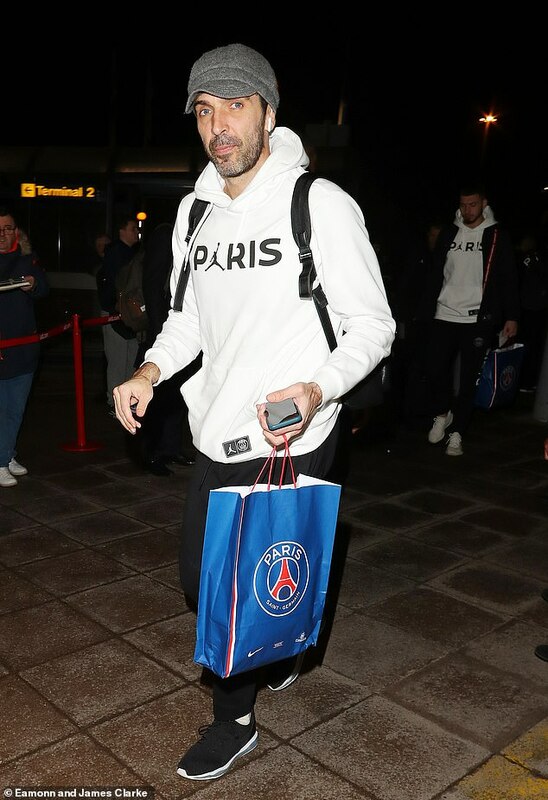 Bleary-eyed and victorious, the PSG team which handed Ole Gunnar Solskjaer his first loss as Manchester United manager flew home in the early hours of Wednesday morning. Thomas Tuchel’s side beat United 2-0 in the Champions League last-16 first leg, leaving the Premier League giants with a huge task in Paris. Kylian Mbappe was the star of the show, netting his side’s second. But his team-mates were left waiting for him and Marco Veratti at Manchester airport. The duo were kept behind for standard drug testing after the game, delaying the PSG plane by an hour. They finally took off at around 1.20am on Wednesday morning, having made their way through Manchester airport kitted out in their special Champions League leisurewear seen throughout the campaign, made by the Jordan brand. The game saw Angel Di Maria’s first game back at Old Trafford after leaving Manchester United in 2015. He signed autographs for fans waiting at the airport, despite having been booed by the home crowd during the match. His manager believed the jeers spurred him on, with the Argentine turning in a vintage performance in the second half. He said: ‘In the first half it was a bit hard for him playing right in front of me and losing many easy balls. He had a bit of a hard time because I was close to him. ‘Maybe he was a bit nervous and a bit overused because he plays all the time for us. ‘I’m happy he stayed confident, he’s always super reliable, he always gives his best and for that it’s easy to forgive him when he has not such a good first half.